Well with 10,000 visits and 300+ posts, I’m feeling all philanthropic whilst basking in the unwarranted glow of 15 minutes of fame. 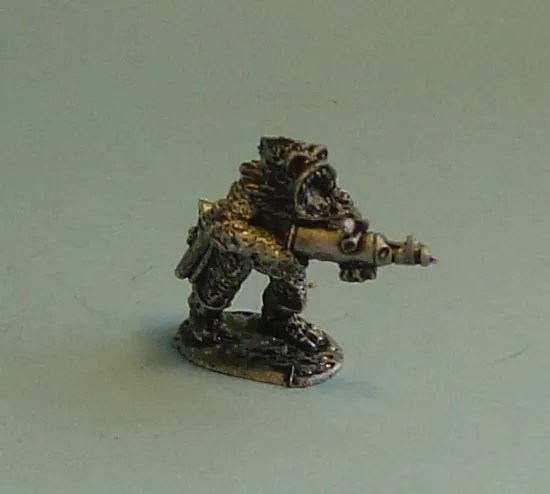 So being a jolly soul, post your guess as to what the figure is here on this blog below, first person to get it right and I’ll donate £10 to the charity of your choice. And for extra kudos provide a scan of the relevant game book. 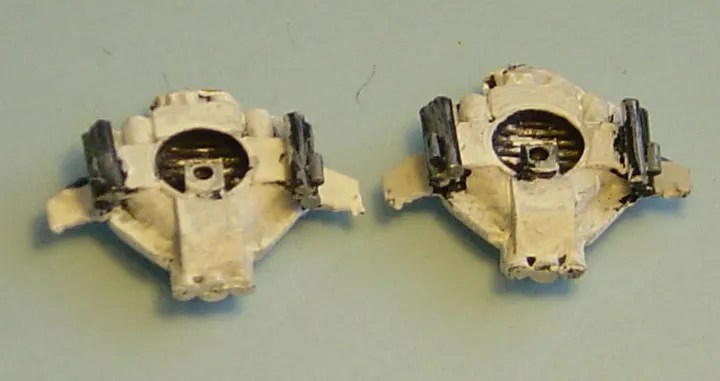 Meanwhile, the Sun Has Got His Hat On again, and I need to finish off my White Russian Lancers in Chinese Service and you may get an update later on ! Another feline casualty of a sun beam. Thanks people, 10,000 Visitors in 7 months to this blog. This is post 303. Is this my 15 Minutes of Fame ? The pictures don’t do them justice ! 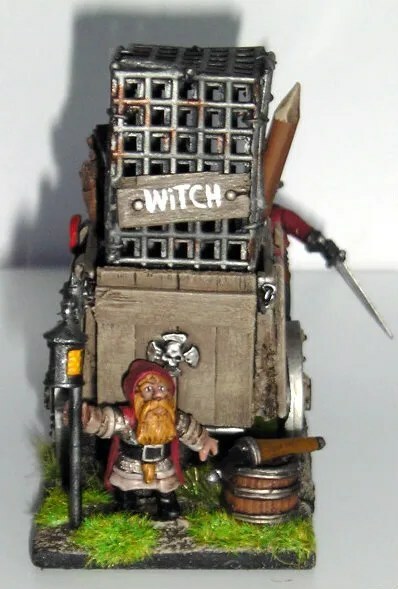 The Brotherhood of the Eternal Watchtower scour Middenheim and the surrounding area looking for signs of heresy; for the Witch, the Beastman, the Skaven, the Goblin, the lawless, and bring them to Sigmar’s justice. 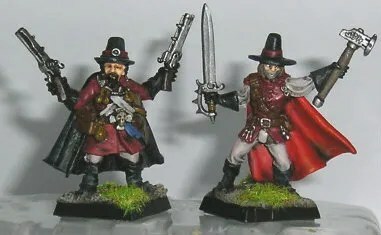 They are a mixed bunch with varied backgrounds – some are devote Sigmarites, some follow Ulric; some are driven by a desire to do good, some by vengeance, some by their own personal daemons (not literally of course!). There are professional soldiers, former woodsmen, farmers, and bandits, and keen amateurs, drawn from near and far by the charisma of their founder and his lieutenants. All over the Drakwald their battle cry, “Nos sumos Aeterna Speculam!” will strike fear into the followers of Chaos. Adan Dammerung was a novice priest when he heard one of Luthor Huss’ fiery sermons. With a sudden certainty he knew he wanted to follow a similar path. Indeed, such is his unbridled fury and faith in the face of Chaos that he causes them to flee before him! Unusually for a Sigmarite priest, he wields a sword along with the typical Warhammer. “Sometimes Chaos must be crushed outright, sometimes it is a canker that can be cut away from the soul”. 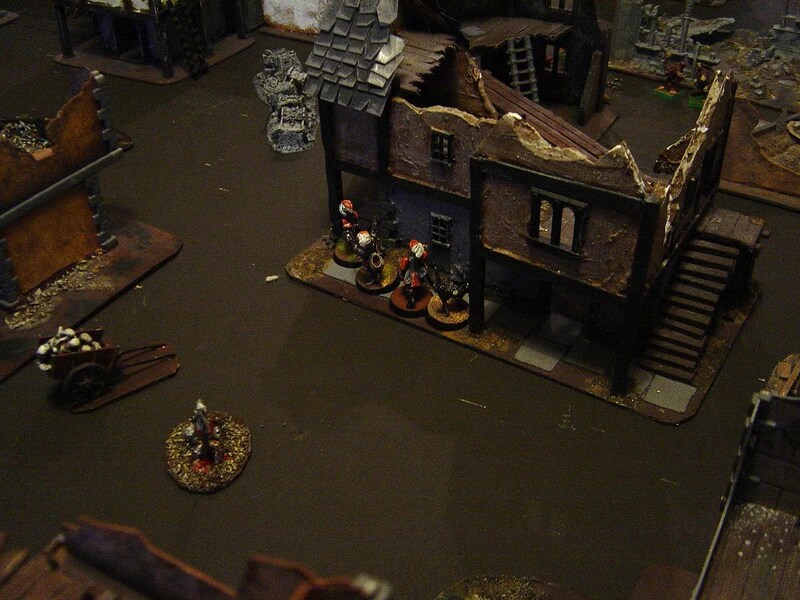 Dammerung acts as confessor for the Brotherhood, and as such is party to all Agis’ secrets. Warmund Kurz is a professional soldier who fought in the armies of Middenland. 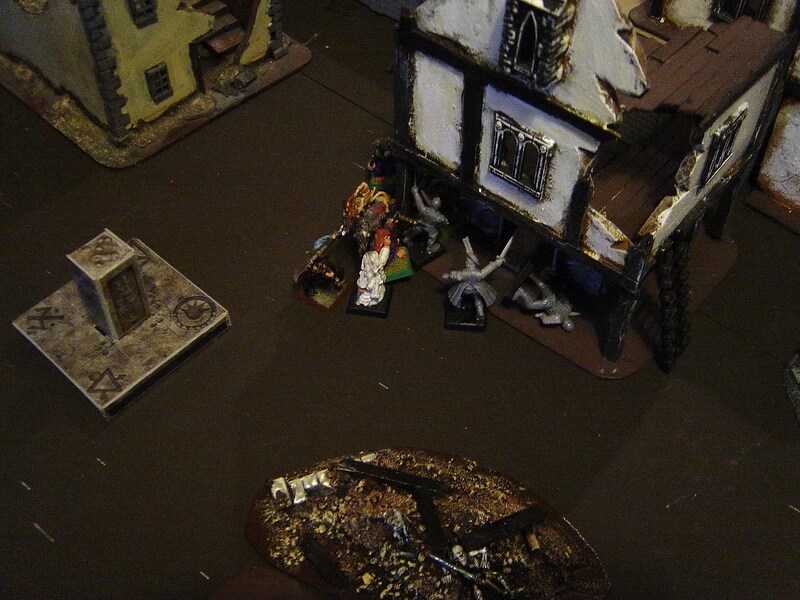 He joined up with the Aeterna Speculam after his regiment was all but wiped out in battle with Orc raiders. The battle was turned when the Brotherhood arrived on the scene, Agis shooting down the Orc Shaman with a runic bullet in each eye. Kurz had no qualms in signing up immediately, bringing a couple of experienced men with him. Kurz is certainly driven, but not a fanatic, and his cool head and military training have become a key to the ongoing success of the Aeterna Speculam as a genuine battlefield force rather than a rag tag band. Kurz likes to take the fight to an enemies’ champions, and eschews either helmet or Witch Hunter hat, after he almost lost a duel with a very tall Chaos Warrior because he couldn’t see his overhead blows coming down! And so it proved. 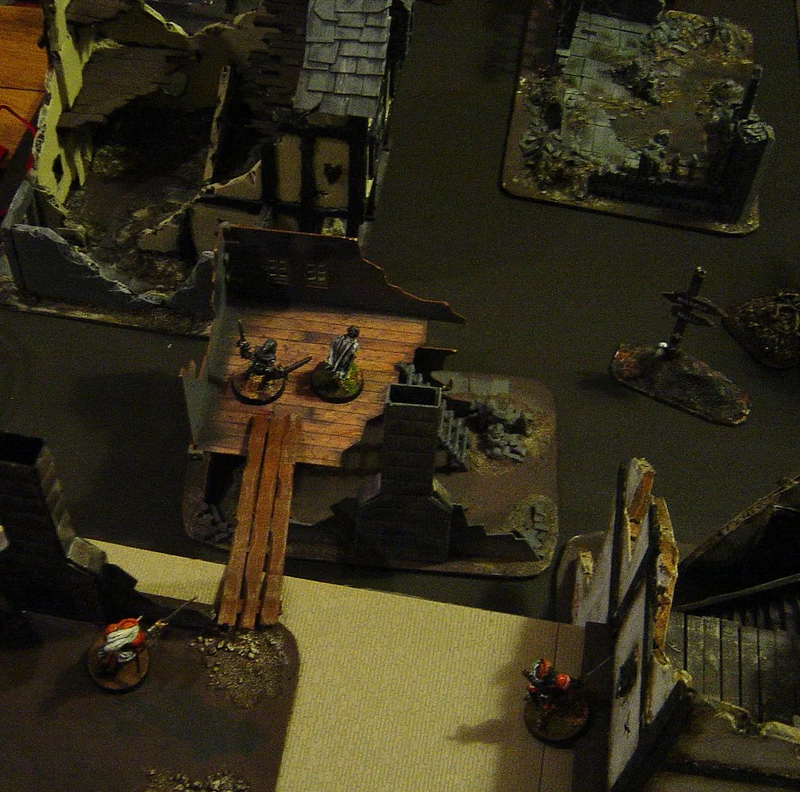 Anthony set up a firing line high up in the buildings, and advanced his warriors and Warlock into the centre of the board. 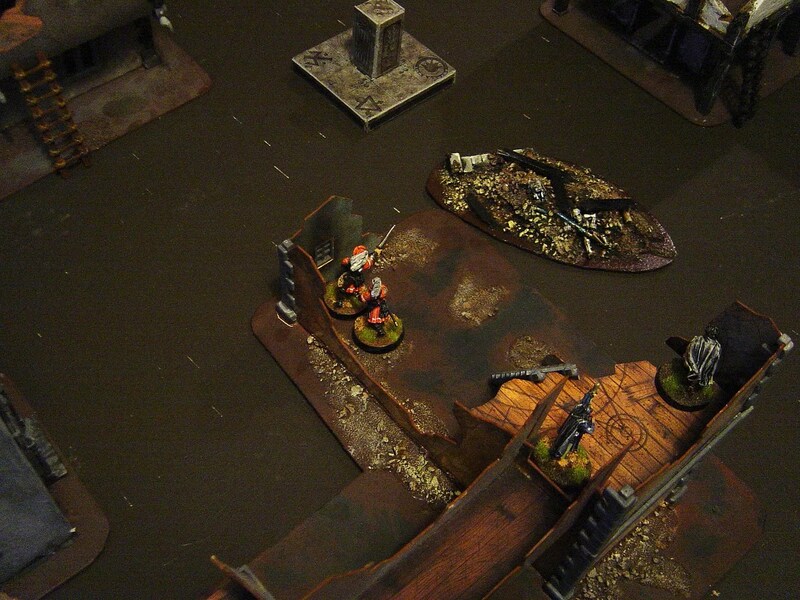 Only for the Skaven to come at them from both sides, and cause a lot of casualties. His archers not having good lines of sight as they were too far back. And so Anthony did a quick sharp exit. 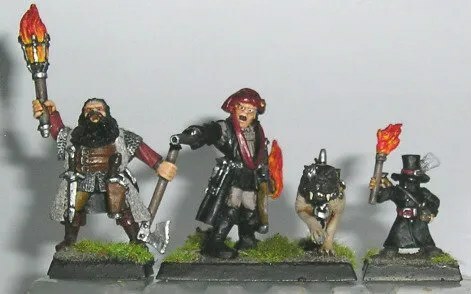 And found that his Captain would be missing for the next three games, so went back to the start and set up a new warband – Dwarves. Jim and I next had a game – and I tried to learn from Anthony’s mistakes. 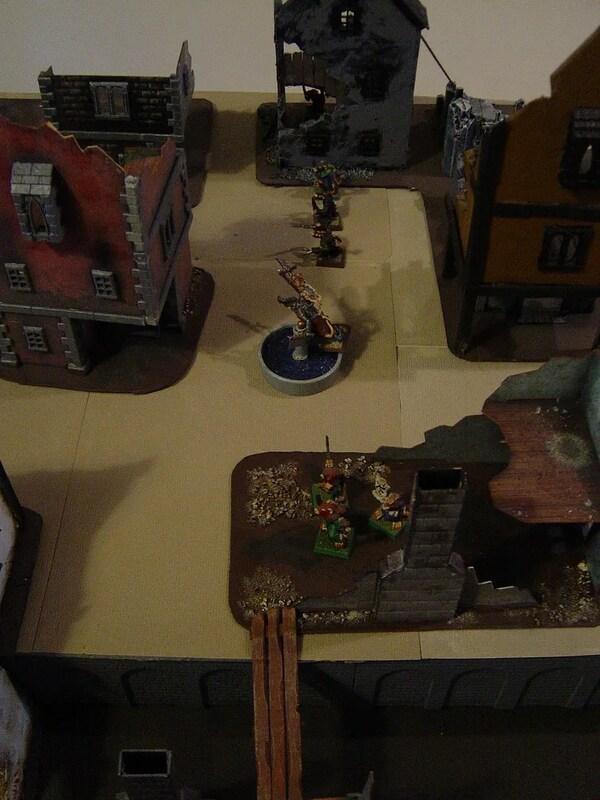 So I sent four combat guys rounds the edges of buildings, whilst my archers (all two of them tred to get a bit further foward to target the Skaven. 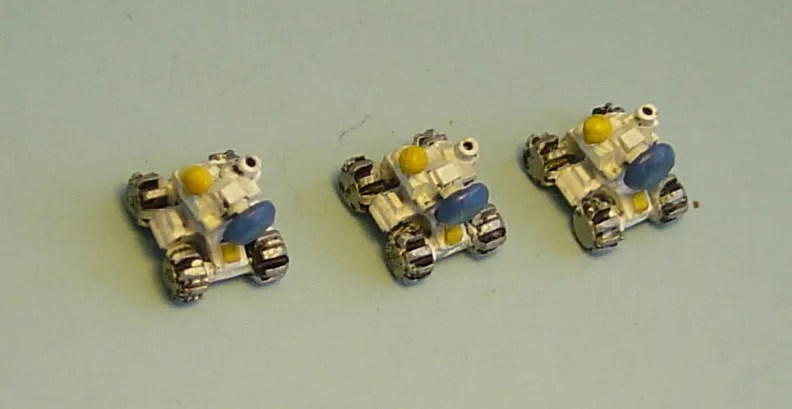 Only to find that one of Jim’s Heroes had got the Sprint skill, giving him a charge range of 18″ meaning he got into combat with my centre group…whilst the rest of his warband mobbed my combat guys. I came away relatively unscathed. 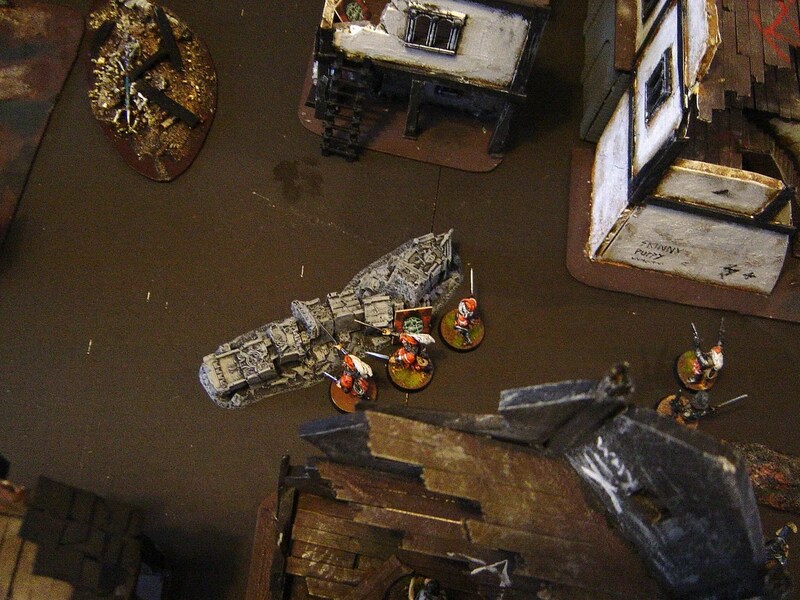 Yet again, we were encircled and picked off by the Skaven and their pesky slings. Even before we could react, I’d lost 4 men, and utterly failed my bottle test. 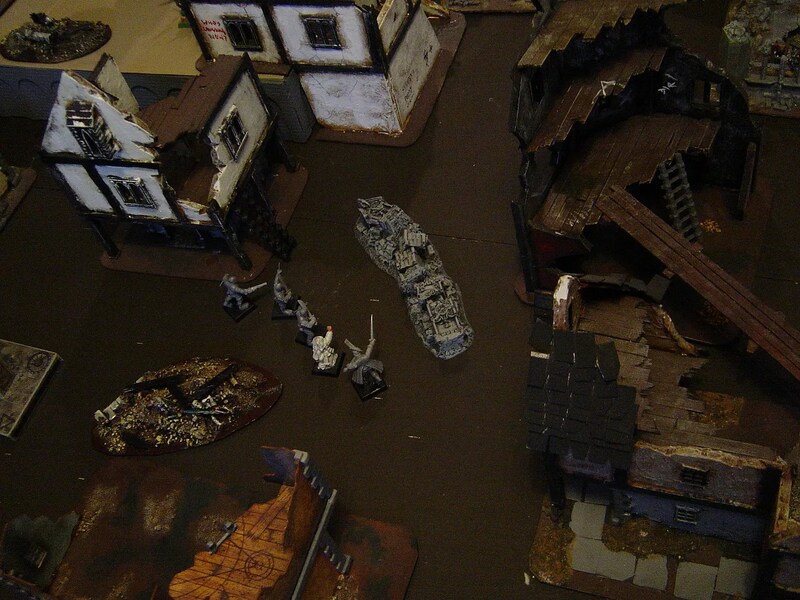 The Dwarves (mostly Long Drong’s Slayer Pirate figures, plus an antique Grenadier model) decided to cut and run shortly afterwards. We had forgotten most of the rules ! They won’t get away with that again ! Its still a really fun game and you can pack loads of jokes into your warbands and their names. 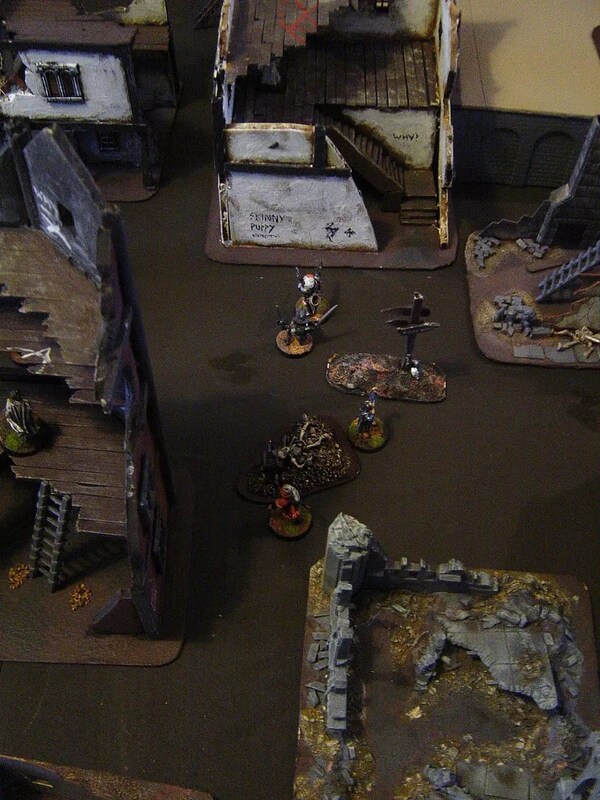 Before I moved to my current location (Carcosa), the Byakhees and I had regular, weekly games of Mordheim and Necromunda. However, in the past 6 years we haven’t played these games at all ! So after Anthony suggested we have a game or two, we set a date, and I found and (sort of) dusted off the scenery I’d built about ten years ago. 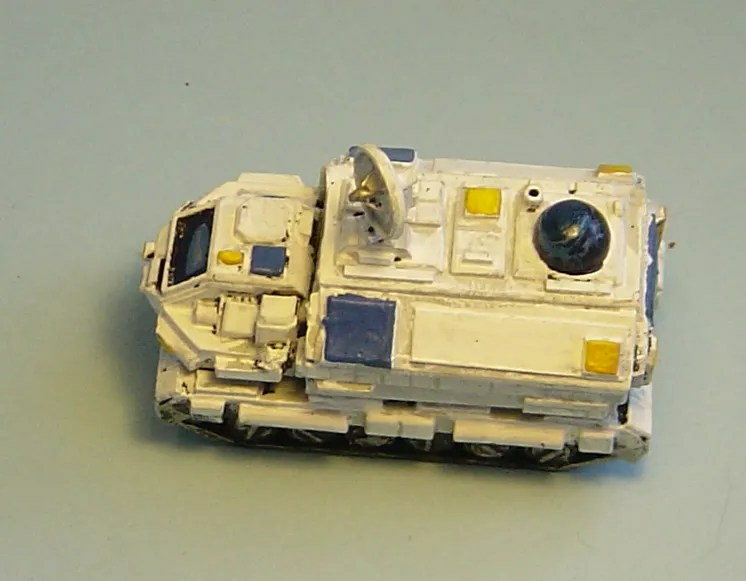 As you can see, its made up from the original boxed set scenery (which was pre printed card scenery with plastic corner walls and other items), the expansion pack and even a ruin from Warhammer a boxed set. 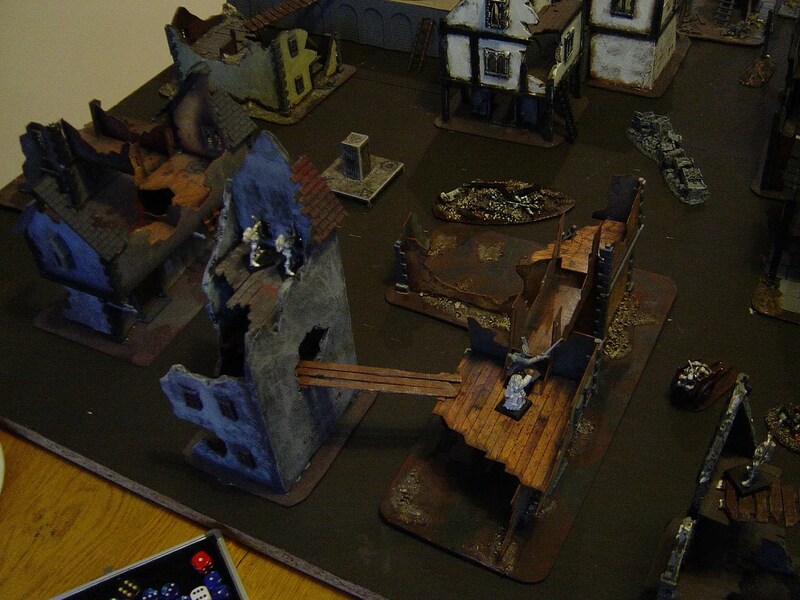 Then I got some 5mm foamboard, a lot of balsa wood, more of the plastic scenery sprues and a 10litre tub of textured masonry paint and went and build the rest of the ruins myself. 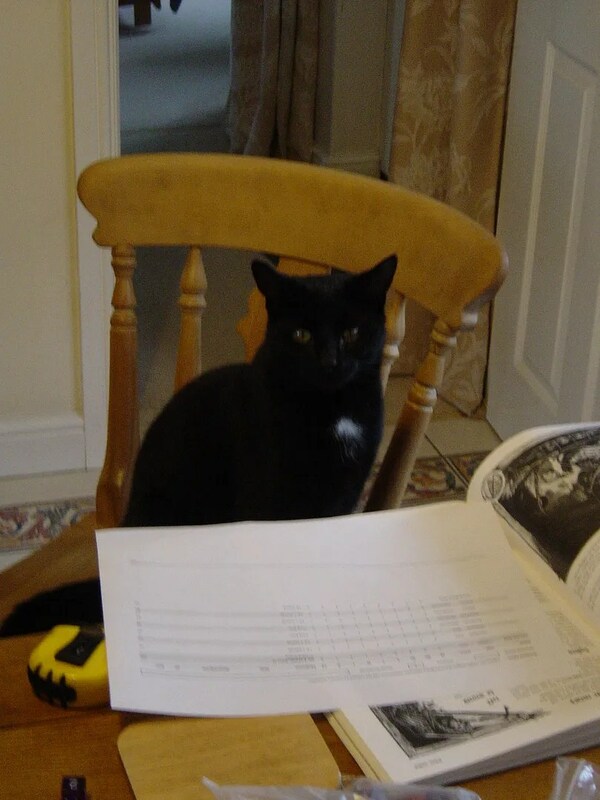 Jim was a bit late arriving, and had to finalise his Warband. So Anthony & I started off a game with Jim reffing. It was amazing we had forgotten so many rules in the intervening years. 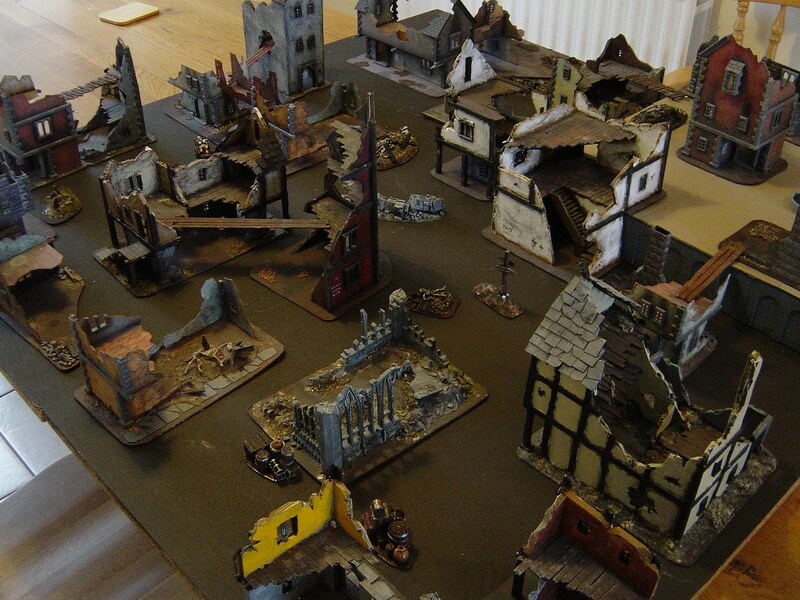 As a cut down version of Warhammer from several editions ago, it still adheres to many of the older rules. 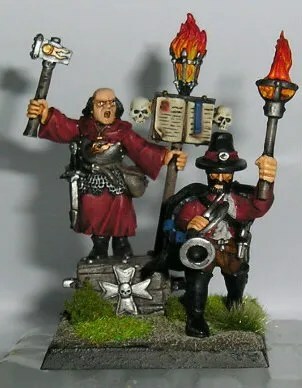 I chose my flamboyant Marienburgers to play as an antidote to all the balck and dark colours of Dark Elves and BUF that I’ve been deploying recently. 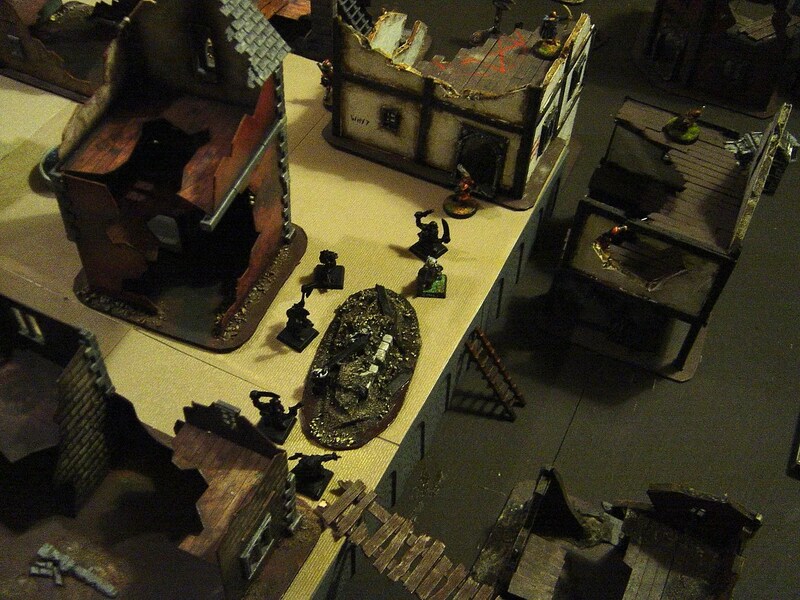 Mordheim is great for picking out all the odd and random figures you have. So we often dig out figures from the Golden Age. 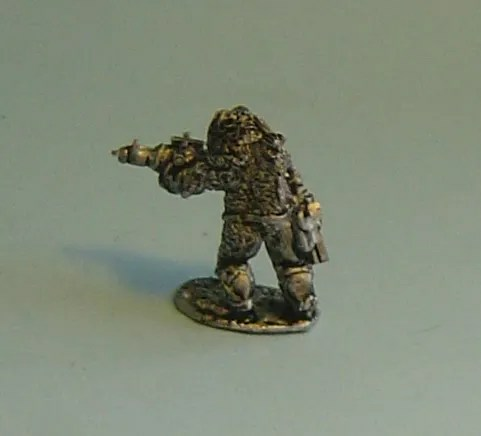 In fact whilst my heroes were all the official Marienburger figures, the supporting warriors and marksmen were old Citadel C series fighters, and the marksmen were Foundry Picts. 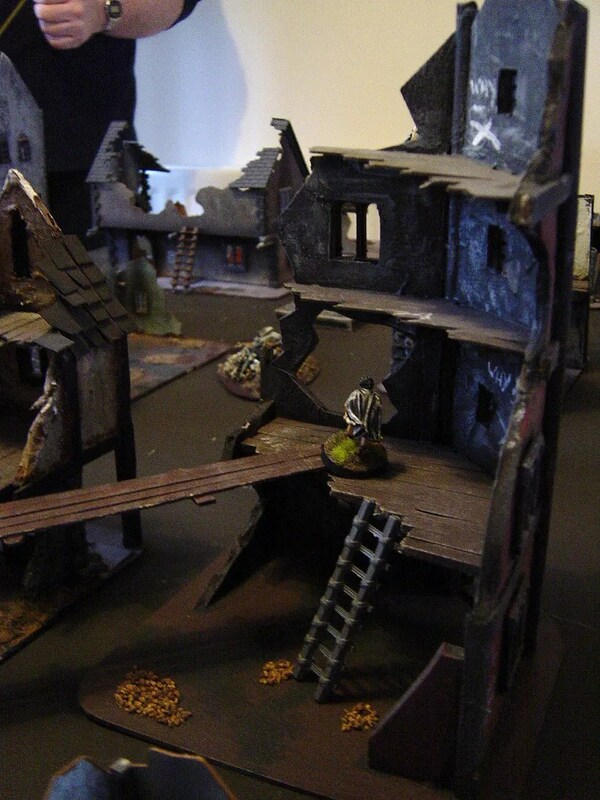 WE remembered that it was always wise to keep groups of figures close by each other – one of the special rules in Mordheim means an isolated fighter often will run for it when confronted by the enemy. Also getting up into the upper storey’s of buildings is good for shooting. Not that it helped me much, having got some Wyrdstone, I had my hero, champion and two warriors put out of action/stunned by SAnthony’s Reiklanders and so bottled it and ended the game after a mere 3 turns ! All over in less than an hour. But it was good fun and I came away with a nice set of loot. 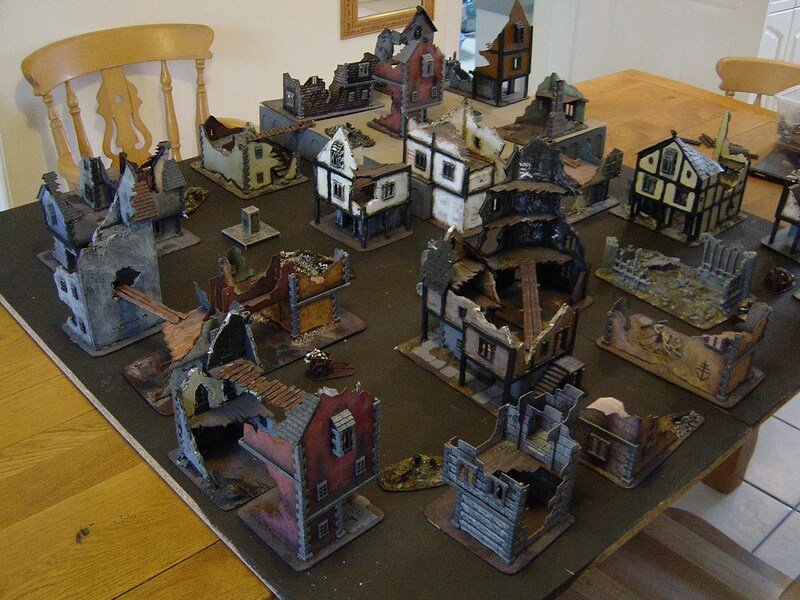 Byakhee Anthony had expressed a desire to do some Mordheim when we went to Colours. So In had a quick rummage and found all the scenery I’d made 10 years ago. Byakhee Jim joined us, and we had four games…. 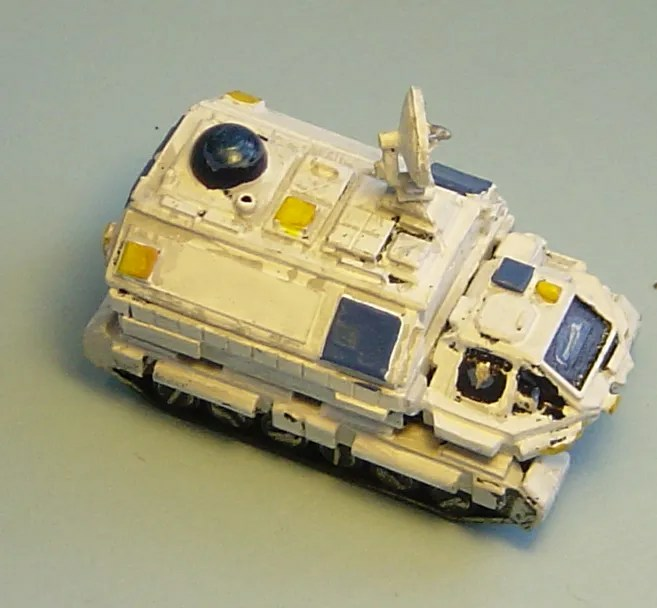 I envisage this as the Command & Control vehicle for an Imperial Police unit controlling some drones and robots. 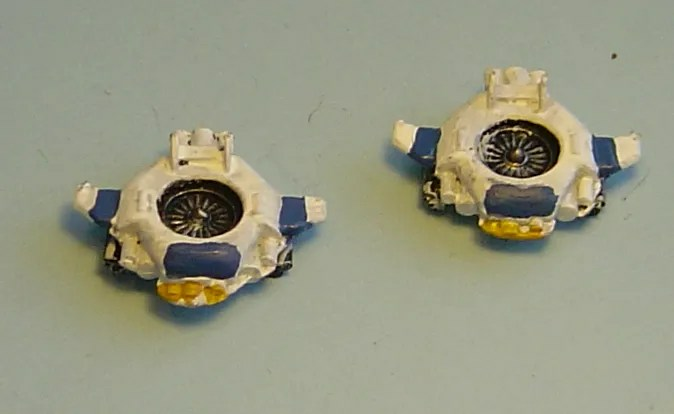 Foundry Arctic Grey, with white highlight. Windows GW foundation blue, and the lighter blue Fundry Deep Blue. Yellow for lights.